An interactive session between DGP Arunachal Pradesh, S.B.K Singh & head of 32 educational institutions was organised by Arunachal Pradesh Police at Police Officer’s Mess on Monday. It was attended by IGP (L/O) Dr S.P. Hooda, DIGP (Hqs) Kime Kaming,IPS, Heads of schools, 3 colleges and representatives from organisation such as HPCL and Art of Living. 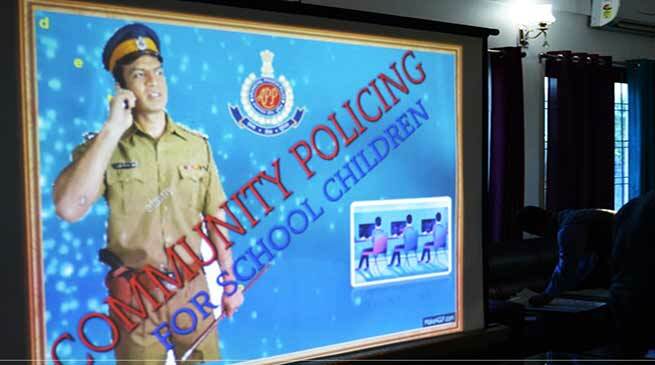 The interactive session was organised based on the Prime Minister’s initiative stressing on the need for proper attention towards school children for quality education and good moral character, for which the National police Mission has recently worked on a project on community policing initiative for Children and Police (CAP). SB K Singh, DGP, Arunachal Pradesh in his key address emphasised on the Students-Police Interaction. He said that Students/Children are future of this country and they have to be provided with holistic education to be responsible world citizen. Education which will prepare them to face the world boldly, help them contribute towards making the society a better place to live. Principals and teachers of the school certainly have a role to play but Police has also a definite role. Most of the students know about police and visualise them what they have seen in the films or may be heard from someone. Therefore, there is a need to increase and improve the interaction between Students/Children and Police. He also emphasised the importance of sending school children to Police stations to receive a first-hand experience on policing and have interactive session between police personnel and students. He further stated that as per request by law collages, PTC (Police Training centre Banderdewa) can accommodate and train faculties of law College in Arunachal Pradesh (Arunachal Law Academy) on certain areas like criminal subjects such as Cr PC, IPC and criminology as part of their internship programme. This innovative idea for organizing interactive session was initiated by Ex. Officio chief adviser, Dr. Sushi Singh of Arunachal Pradesh Police Welfare society who as an educationist understands the importance of initiating the dialogue between schools and state police as an integral part of community policing. forces. Therefore, preventive actions and awareness campaigns are need of hour to prevent from child abuse in India, child trafficking, cyber safety for children, drug addiction and issues related to schooling such as bullying, teasing and ridiculing.